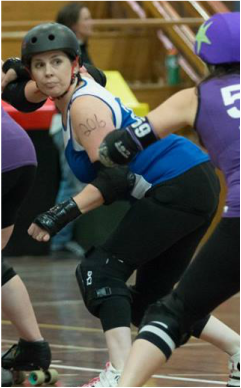 Dame of Bones - 206 - Christchurch Roller Derby. Strong City. Stronger Skaters. They are open minded, have a sense of family and are supportive and accepting of all, best of all we have a lot of laughs - why wouldn't you? Any Dinosaur but Barney! Perhaps Dorothy who likes roses, cause all girls love roses don't they? The shopping trolley and the sprinkler - they both bring a smile to your face!